In the second half of the XIX century, Catalan landscape painting acquired an importance and personality previously unknown to this genre. Among the landscape artists of the moment were Josep Armet and Josep Berga, however it was Joaquim Vayreda who became the foremost Catalan landscape painter. In his work, the landscape took centre stage. Vayreda was the founder of the Olot School of countryside painting, a movement characterised by the taste for painting from nature and directly inspired by the works of the French artists of Barbizon School. Their canvases, which enjoyed wide exposure and considerable success, influenced numerous Catalan landscape painters. 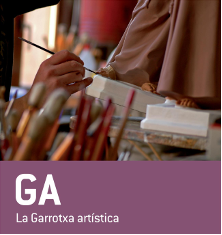 The Museu de la Garrotxa has an extensive collection of paintings by the Olot School, and the Museu dels Sants has a collection centred on one of Olot's traditional industries: religious imagery. And it is Olot's saints' workshops that make virtually all the religious sculptures that are found around the world. The museum shows the whole process of making these pieces and allows you to see, first hand, the inside of a workshop (on week days).